The defense of the Exportadora Bananera Noboa, property of the Prian leader, Álvaro Noboa, brought two actions to avoid the Internal Revenue Service (IRS) from collecting a gloss of $ 85 million for evading the taxes of the year 2005. The first step was made by a judicial means, and the second action was performed through administrative channels, since the company rejects that it owes money to the Treasury, according to the judicial director Fernando Alarcon. With these actions the defense stopped a coercion process, by force that had announced yesterday by the director of the IRS, Carlos Marx Carrasco, during an interview with Radio City last Friday. On that day Alarcon asked the revocation of the order made by the Second District Court Board of the Treasury, in the office of Guayaquil, which dismissed the objection the firm submitted previously. Based on that ruling Carrasco announce last week that the export company owed the State near $ 90 million. However Alarcon denounced the violation of process norms, because, among other reasons, the order must have the firm of the three members of the board, and not just one. He also explained that the defense presented before the IRS a resource of revision, since it rejects the calculation made during the auditing process against the company. Alarcon confirmed that there were several charges, (unloading, ripening of the fruit, insurance, and charter, among others. The IRS didn’t consider on its calculations the tax year of 2005. “Those expenses aren’t recognized on 2005, a decision that has been made for the tax year of 2006, if they are recognized. What does that mean?, the IRS made a mistake.” Carrasco explained the subject last week, saying that the Tax reform allows the IRS to employ methodological prices for the transfer of the decision process, and through that it prevents taxpayers to make their exportations to financial havens. 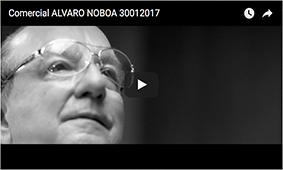 During the sabbatine link it insisted that this is not a victimization or complaint against Álvaro Noboa. The IRS doesn’t consider reasonably that the Exportadora Bananera Noboa pay on 2005 a tax of $ 259,218 if their reported sales exceeded the 300 million dollars. The IRS located the company on the place 59 from 62 financial groups due the volume their sales generate.